sunshine and whimsy. : a tale of 7 wedding dresses. a tale of 7 wedding dresses. You guys, I ordered 7 wedding dresses tonight. SEVEN. Fingers crossed I love one of 'em. Why did you order them? Why not just buy one from a store? I went wedding dress shopping and didn't find any I liked. They were all long, poofy, fancy, bedazzled, etc. I wanted a simple, short dress. Nothing too traditional or fancy. Why not have one made? I do live in China where it's fairly easy to get a dress made. But I didn't know exactly what I wanted and I couldn't imagine what I'd look like in a dress just from looking at a photo. I didn't want to pay a large amount of money and not love the result. Not really. None of the dresses cost that much, Shopbop and ASOS offered free shipping, BHLDN's shipping was $45, and we only ended up paying duty for the BHLDN dresses. I didn't show anyone except Melissa and Alanna (two of my bridesmaids) the dresses. I didn't want anyone's opinion to sway my decision. And you wouldn't take your co-workers or acquaintances wedding dress shopping with you, right? But now that I've chosen a dress, I thought you might like to see them! Obviously, I can't tell you what I thought about the dresses after I got them and tried them on, because you'd know which dress I chose (I'm keeping it a secret from Tony), but I can tell you what I was thinking when I ordered them. TFNC Prom Midi Dress from ASOS / Short, check. Simple, check. Strapless, maybe? I liked the neckline and the waist. I didn't like the length but figured I could have it hemmed easily enough. ASOS Petite Bandeau Dress in Floral Lace / I thought it might be too flowery in person but figured I'd give it a try since shipping was free and I knew I'd probably be returning other dresses anyway. ASOS PETITE Dress in Floral Burnout / I didn't ever plan on wearing this as a wedding dress, but thought it might be okay to wear to the rehearsal or a wedding shower or just as a "normal, everyday" dress. Frock and Frill Embellished Top Skater Dress from ASOS / I liked that I wouldn't have to worry about my bra straps showing (always a concern, fellow well-endowed ladies, am I right?) or wearing a strapless bra. Wasn't sure about all that embellishment, though. Would it end up looking too blingy or fancy in person? Joanna August Newbury Cap Sleeve Dress from Shopbop / I didn't think I wanted a long dress, but what if I did and I didn't even know it? I had to order one or two just to be sure. I liked that this one was simple and figured I could dress it up with jewelry. Note: I ordered according to the size chart and it was way too big. Melissa, Alanna, and I actually laughed. Size down. 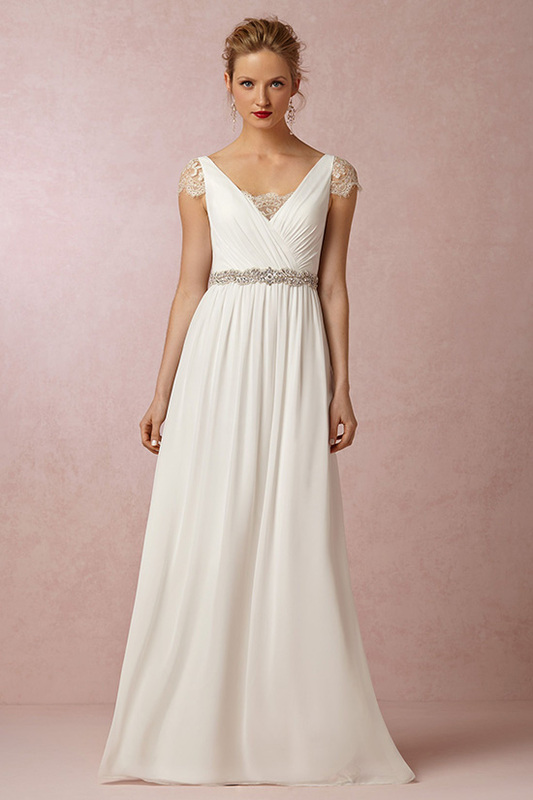 Evangeline Dress from BHLDN / I loved the look of this dress! Long, yes, but simple and elegant. I could picture myself getting married in a park wearing this. Loved the sash with it but it was sold separately for $180, only $80 less than the dress. No, thank you; there must be other places to buy a sash. Note: I ordered according to the size chart and it was too big. Size down. Prato Romper from BHLDN / This was the wild card. A wedding romper? Could I really get married in a romper? I actually saw it a couple weeks before I ordered all these dresses and couldn't stop thinking about it. It was pretty and fun. I imagined it being comfortable and perfect for a wedding picnic. I loved it! I wanted to wear a wedding romper! So I ordered it. And there you have them! My 7 wedding dresses! * Want to try and guess which one I chose? P.S. Our Save the Dates, our Chinese wedding, and thoughts on wedding planning. *Actually 6 wedding dresses and a romper. But that takes longer to say and requires further explanation, trust me. They're all beautiful. I'm gunning for the romper for some reason which is not like me! they are all gorgeous, but then again, so are you so you will look fabulous in ANYTHING. I can't possibly guess which one but I wanted to let you know that a friend of mine just bought the most beautiful crystal embellished sash/belt for her wedding dress on Ebay for 25$ and it was beautiful. I have no idea which one! They are all great. Judging from your friend's comment ... it is not the romper ... but I wish I had seen that romper during my "wedding event season" and would have worn it to the rehearsal or bachelorette! 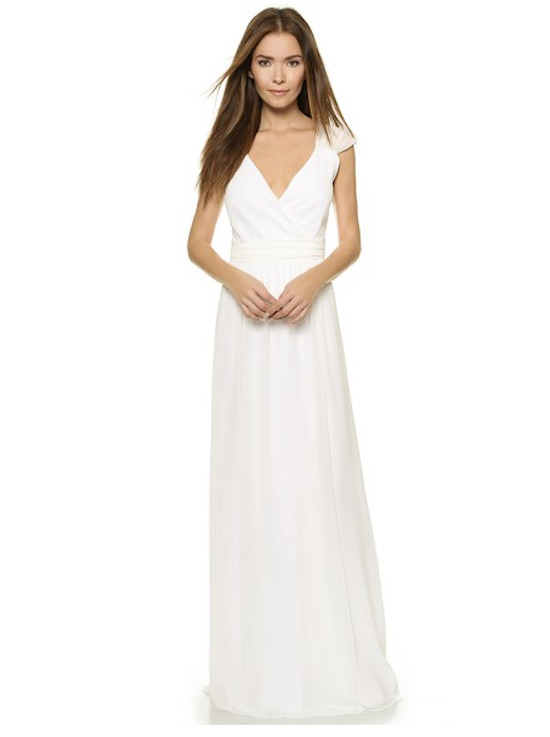 I can't wait 'til after the wedding where I can share more thoughts on these dresses. The romper is fun! I can't wait for everyone to find out! This blog post is making me excited! Kate, that is SO sweet of you! Thank you! And thank you for the tip! I hadn't thought of Ebay! Oh they are all cute. I have no idea which one you would have chosen but I look forward to finding out!